The world renowned liquid cooling manufacturer, Alphacool, is currently the only manufacturer worldwide that relies on pure copper for all water cooling parts. The chambers, water channels and fins are all made of pure copper. As a result, Alphacool radiators offer the highest thermal conductivity, which means that the performance limit is significantly higher than with aluminium radiators. In short, the cooling capacity is simply higher if you want to dissipate a lot of heat. Copper has been the best choice of materials in the water cooling sector for years. All Alphacool radiators are designed for silent operation. You do not need fans with particularly high static pressure to achieve the desired performance, so you can rely on normal fans with low speed. The loss of performance compared to special fans for radiators is minimal and is usually negligible. Those who would like to go the extra mile and achieve the maximum cooling capacity by using specially adapted fans for radiators will not be disappointed either. Maximum performance does not suffer. Thanks to the copper material and the high-quality manufacturing process, you still get an enormous increase in performance for your water-cooled components, especially with high performance fans. The fans are mounted with the included 30 or 35 mm M3 screws. All Alphacool radiators offer protection that prevents the screws from being screwed into the fins. A metal plate below the holes prevents further penetration of the screws which may otherwise cause leaks. To mount the radiator directly on the housing, suitable screws are included package too. 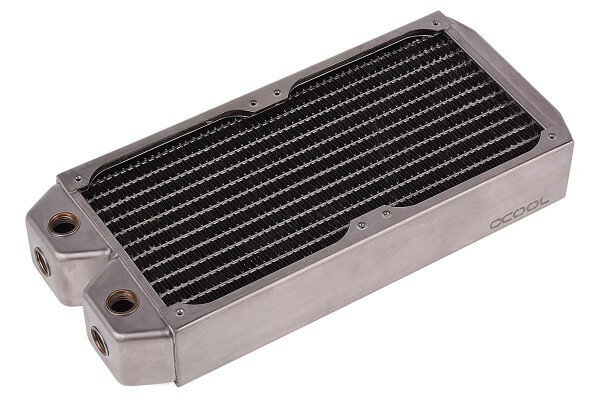 With the NexXxoS Radiator series, Alphacool covers almost all sizes and offers the most comprehensive portfolio of all manufacturers in this area. From 40 mm dual radiators to triple radiators for 180 mm fans. In addition, different thicknesses: ST30, XT45, UT60 and Monsta, whereby the number always stands for the thickness of the radiator in millimetres and the Monsta radiators are approx. 86 mm thick. In addition, there are special sizes and HPC industrial radiators. These are special radiators designed for high pressure systems. The connection options for NexXxoS radiators are extensive. While the narrow ST30 Radiator has 2 inlets and outlets each, all thicker radiators from the XT45 upwards offer 3 inlets and outlets in "G ¼" format. In addition, the rear chamber has a G ¼"connection for filling or venting air. This allows you to mount the radiator in any desired position. There is an exception with the X-Flow radiators. In the ST30 version, these have 2 inlets or outlets at each end chamber. Here the water does not flow in U-shape as usual, but from one side of the radiator to the other side of the radiator. The models from size XT45 have as usual 3 inlets or outlets at the chambers. The X-Flow radiators offer you further possibilities to adapt the water loop in your system according to your wishes. With all the radiators from the Alphacool NexXxoS series, you get a unique full copper radiator with an outstanding performance. Since the Alphacool NexXxoS full copper Radiator-Silver Nickel edition has stainless steel side panels, the same characteristics are present here as with any stainless-steel product that may be found in the household. To ensure there are no fingerprints or stains and that rust or oxidisation cannot occur, we recommend that you clean and maintain the outside of the radiator with cleaning products suitable for stainless steel.